I was going to put a day for this but I don’t know what day it is here yet. Talitha says there’s a calendar here called an astral calendar, I think? Anyway it’s got all these circles and to find out what day it is you have to see where your circles touch the other circles and then there’s a line from this circle to that circle and I’m getting jumbly puzzles just writing about it. I’ll figure out a day to put for this later when Talitha figures out more of that book she got. Today Ranko found the jackpot! There was another wooden shack on the whole other side of this big farm house, and inside we got all these farm tools! Let’s see, there was a pitchfork and a shovel, and a plow blade, and a bag of dirt, and lots of little empty cans, and tons of gloves. We have enough gloves to last us for a million years now! Anyway, inside the other shack we found an oil lantern and a little container kind of like a vase that is about halfway full of oil for it. There were two shacks. Did I tell you that part? We found the farm stuff in one but there was another one that was the other one from before, I think. Okay, so it finally got sunny after it rained for a whole day and a half, but we still only use the lamp at night so we don’t run out of oil. Sometimes I like when it rains but I still like sunshiny days best. I bet if we find another wooden shack there will be more oil in it, but Alanna still said we should be careful about burning the lantern too much. I hope we don’t find any more gloves, though, or we’re going to run out of places to put them. We only have twelve hands! I’m not too sure about this ring. I know Talitha says I have to be virtuous and courageous and honorable so it’s more powerful, but I don’t know if I know how to do all that stuff! It sounds hard! I mean I would never lie or steal anything, but I think there’s more to it than that. After me and Talitha read more of the book, we noticed it kept going back to the word ‘honor.’ I’m pretty sure I know what that means, but I’m still not sure. I guess I’ll just have to do my best. I wonder when I’ll find the sword? I hope it’s not scary or something. I’m pretty sure it won’t be. I really like my ring. It’s pretty and I really like wearing it. I hope Enken comes back soon. Cici Ryan clumsily pushed her way through the side door of the farm house. Normally she would have had no trouble with the wooden handle and lock, but at the moment, her hands were full. She carefully walked through what everyone had agreed was at least some kind of kitchen and arrived in the main room where Alanna, Shannon and Jessica were enjoying a bowl of apples they had picked from the farm’s nearby orchard. “What is that! ?” Shannon exclaimed. Jessica put her hand over her mouth to keep from laughing. “Is it alive?” Alanna asked. Cici stalked over to the table and practically poured the enormous orange cat on to the wooden surface. It didn’t move. It just laid there as if it had been hit with knockout gas. “Because I’m strong!” Cici replied, as if announcing the most obvious thing in the world. “My mom and dad never let me have a pet, but Hikousen is my pet cat now.” Cici started stroking his ears and back. Hikousen moved just enough to make his other ear reachable, then didn’t move again. Growing up, I played a lot of sports. I joined numerous organizations for kids my age including scouting, a swim team and finally marching band in both high school and college. The one thing all those experiences had in common was the primacy of teamwork and sportsmanship. I learned how important teamwork was for success in life from participating in those clubs and teams. I found out what it was like to be a champion, and why I was able to participate in so many victories. I’ve been asked on numerous occasions to describe the LadyStar story in as few words as possible. Business executives call it an “elevator pitch.” I’ve gotten pretty good at rattling off shorter and shorter summaries of my work over the years. Now I can describe it in one word: Teamwork. That word raises eyebrows from time to time. You see, all seven of my main characters are girls between the ages of 11 and 18. Unfortunately in American popular culture, we don’t do a very good job of portraying girls working together as a team. When America encounters more than one fictional teenage girl, they are usually rivals. If you’ve spent even a little time watching television written for teenage audiences, you will instantly recognize how central rivalry is in many storylines. I call it the “homecoming queen syndrome.” The show starts with many girls, and ends when one claims the tiara and all her rivals are destroyed. That’s not a healthy message. It becomes destructive when it is portrayed as normal. Treachery and bitterness are a reality, to be sure, but they certainly shouldn’t be presented as goals or as a basis for success in life. In LadyStar, Jessica and her friends work together as a team to overcome challenges and obstacles. Each character has a different personality and brings different strengths and weaknesses to the group. Throughout the story, the girls put a great deal of effort into learning how to work together. They don’t always agree, but they never become bitter or hostile to each other. There are no attitudes. There is no unacceptable language. The characters don’t betray or sabotage each other. This basic focus on teamwork becomes very important later in the series because each character develops different powers and fighting abilities. They quickly learn to depend on each other. Jessica Halloran’s adventures powerfully reinforce the values of friendship and teamwork chapter after chapter. We’ve never had a problem teaching young boys the vital importance of teamwork. There is no reason we can’t teach exactly the same values to girls. Communicating those values is one of the reasons I write these books. You can be sure when I write an adventure series for boys, teamwork will be one of its core values as well. But teamwork alone isn’t enough. I’d like to take this opportunity to thank you for considering the LadyStar™ fantasy adventure series. 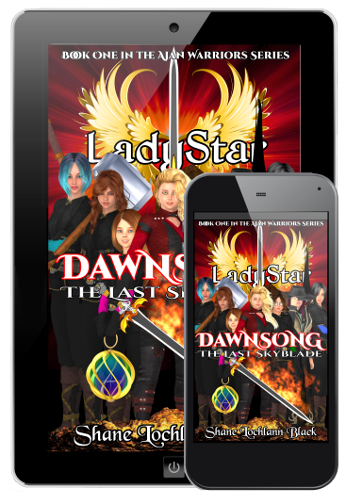 LadyStar for Warrior Moms and Warrior Dads will take no longer than fifteen minutes to read. It will describe why I believe the LadyStar series is important, and why I think my characters will serve to inspire, strengthen and encourage young readers like your child. When we started this project all the way back in the summer of 1998, we knew we were setting some pretty ambitious goals for ourselves. My artists, my editor and my technical staff are some of the best in the world at what they do, and now I believe we’ve succeeded in launching one of the best action-adventure book series available today. My name is Shane Lochlann Black. I’m a science-fiction and fantasy adventure author. I’ve been writing professionally for video games, television, major corporations and my own publishing company for more than 25 years. I’ve written and published more than 90 books in the last seven years. I’ve worked in animated television, children’s educational and interactive software and merchandising and licensing for numerous popular characters. I hold the degree of Bachelor of Arts in English Education. I’m academically qualified to teach the English language up to the high school level. My university emphasis was creative writing. Both my parents were award-winning television and newspaper journalists, so I come by my writing talent honestly. When I first set out to bring Jessica Halloran and the Ajan Warriors to life, I was in the process of writing an episodic video game script. My company had invented a point-and-click adventure playable in a standard web browser. I needed characters and a story. My first thought was to license another company’s characters, but that proved to be more expensive and time consuming than I thought it would. So I created a story world called LadyStar. My first adventure game went on to rather impressive success given its limited production values. It became clear after a while that the characters and world I had created were far larger and had far more potential than just one game. As I explored all the options available to me, I adapted the story to other media and watched it grow. We published a print manga. We published a web comic with more than a quarter million readers. We produced a full line of licensed merchandise. We recorded an audiocast. I wrote a 79,000-word novel which remained my best-selling book for three years. Each time we developed and released a new product, the story got stronger, the characters became more interesting, and the world they inhabited became more vivid. All we needed was something to bring it all together. So in January of 2017, I sat down to a blank screen to reboot my series. I wrote an original full-length fantasy adventure novel called Dawnsong The Last Skyblade. I believe it is the finest work of my career so far. Onward to Chapter Two: Teamwork! All six girls were gathered around the main table looking at Talitha’s book. Not long after the girls “moved in” so to speak, Alanna had organized a cleaning detail. The search for furniture to dust led to the discovery of more than fifteen rooms, some of which were furnished, some of which seemed to have been once set aside for storage. Ranko and Talitha made the beds as best they could using what linens they could scrounge up. During the exploration party, Shannon had discovered a collection of partially used candles each mounted on a pot metal holder. 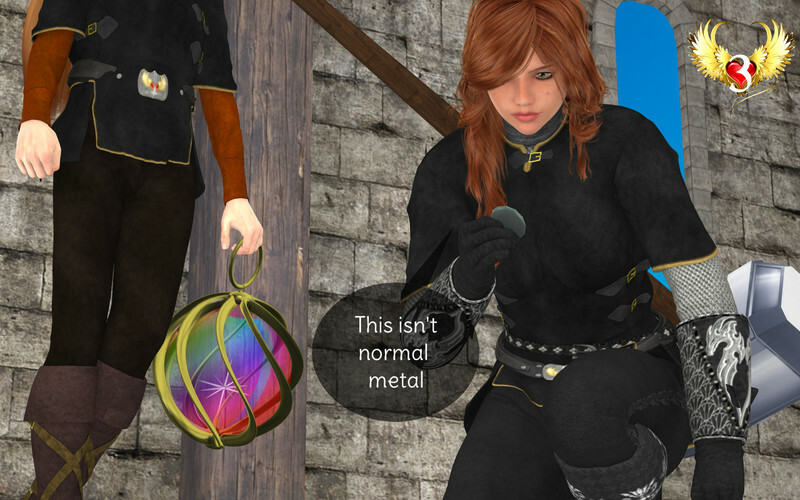 After considerable effort had been invested in figuring out a way to get a fire started during a driving rainstorm, Jessica discovered a metal box containing several broken pieces of flint. With Talitha’s help, the girls assembled a small nest of straw in the fireplace and managed to get it to light by striking the flint against a metal cup Alanna found in the water barrel. Moments later they had light in the farm house. The scent from the candle helped dispel the musty air. It even seemed a little warmer. “You know we could use a torch or two if we’re going exploring,” Alanna said. “Except we’re not going out there at night,” Shannon replied. “Okay, I have to ask, Professor. What is the deal with that book? Where did you find it?” Ranko asked, leaning against the big table’s surface with both hands. Talitha turned the page. She hadn’t spoken more than six words since they got inside. “The one from my ring?” Jessica asked. Talitha nodded. “Was it part of the map?” Alanna asked as she and the other girls stood to get a better look. “Not the dot that I touched?” Ranko asked. “That doesn’t look like any language I’ve ever seen,” Shannon said. “Like fairy tales or something?” Jessica asked. “I feel like I just got beat up by my English homework,” Ranko said. “That’s what that weird guy was talking about!” Shannon said. “Well? Do you know?” Ranko asked Talitha. The bespectacled girl shrugged. “Well who knows! ?” Ranko gestured with both hands. Alanna shrugged. Ranko threw a piece of flint over her shoulder and collapsed into one of the wooden chairs. “Super-well,” Talitha said quietly as she turned the pages. “We have to find some notebooks!” Cici said. “And pencils and pens! And crayons so we can color them!” Alanna helped the younger girl up on her lap so she could see better. “Okay, so you’ve got a handle on the written language. What have you learned from this thing so far?” Shannon asked. Alanna and Jessica glanced at each other. “I’m glowing. Or, I was glowing. At least sometimes.” Jessica smiled and let her chin rest on her folded hands as she leaned her elbows on the table. Ranko made a face and shoved Jessica’s shoulder. “Pssh. It ‘likes’ me,” she said sarcastically. Jessica closed her eyes and kept smiling contentedly. “How do we get the sword one?” Jessica asked. “That’s the confusing part,” Talitha replied, turning ahead in the book several dozen more pages. “Okay, if the Professor is confused, we’re sunk,” Ranko said. The other girls leaned closer to see what Talitha was pointing at. “What does that mean?” Shannon asked. “If winning and looking good doing it are evil, then I’m a super-villain!” Ranko boasted. “Okay, then. Goofball is our secret weapon. If we run into something haunted, like evil scarecrows, she goes first,” Ranko said. “What? You’re glowing, you’ve got a sword and you’ll never tell a lie or steal my lunch. You should march right out there and ‘chop chop.’ No more haunted scarecrow,” Ranko said. Shannon and Alanna smiled. “I liked it better when it was just glowing,” Jessica said, folding her arms and pouting. “There are seven other rings,” Talitha said. What’s Dawnsong: The Last Skyblade About? When an idealistic boy steals a celestium sword and gives it to sixteen-year-old Jessica Halloran, he doesn’t realize he has broken a centuries-old bloodsworn truce between Aventar’s most ancient and ruthless guilds. Mercenaries, assassins and hideous creatures suddenly emerge from every depraved and unclean place across the land seeking to claim Dawnsong for themselves. The long dormant Champion Skyblade’s magic inexplicably responds to the girl, which inspires one guardian of the truce to intercede to protect Jessica’s life. Reina’s act is an open declaration of war that threatens to plunge the seven kingdoms into chaos. Jessica quickly learns Dawnsong is most powerful when she is truthful and acts honorably. Her compassion becomes healing magic. Her joyful personality becomes a golden glow that follows her everywhere and her kindness becomes a blessing that heals and strengthens others. Even learned scribes and arcanists cannot explain it. Now, after the discovery of a hidden map to a place called the Palace in the Sky, Jessica and her friends find themselves in a race to rescue the other seven Ajan weapons before Lord Dane and his vile Cryptics discover and destroy them! Here begin the adventures of Jessica Halloran and the Greatest Fighting Team of Teenage Girls Ever Assembled! Dawnsong: The Last Skyblade is available now at the Palace in the Sky Bookstore! 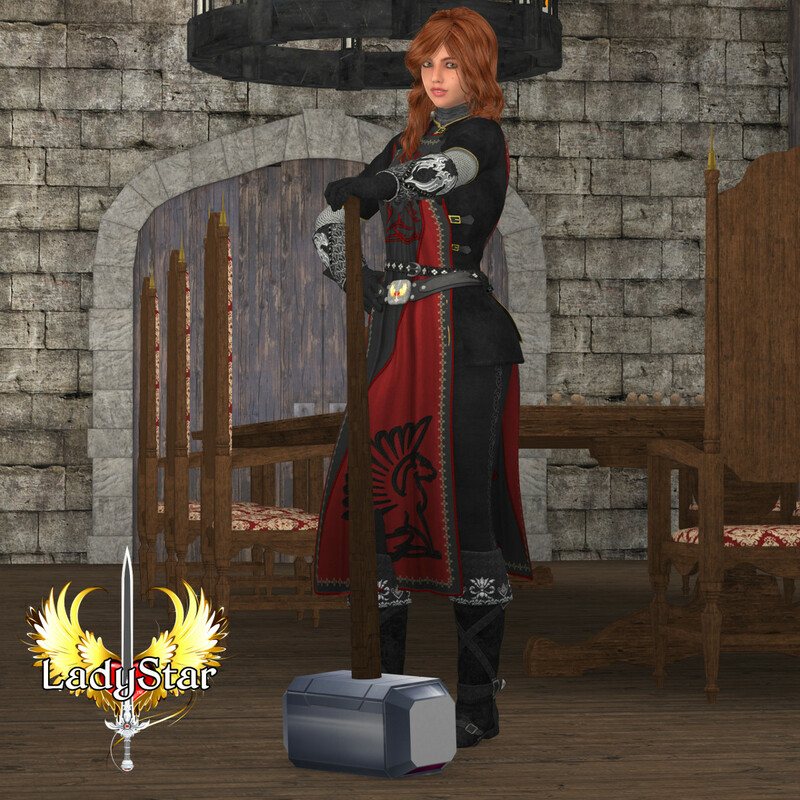 Posted in LadyStar No Comments on What’s Dawnsong: The Last Skyblade About? The hollow sound of a fist against rotted wood caused a small flight of sickly birds to scatter from the dead branches of a nearby tree. Unlike many of the others who hurried through the darker sections of Escator, the unarmed man wore no cloak and no cowl. The right half of his face was covered with a thick dark gray cloth wrapped much like a bandage. The houses in the Escator Manorial District were dark, uninviting structures. What lights were visible were pale and cold, and often only shone through upper windows. The walkways were gated and the remains of ivy plants and creepers hung on the iron bars of the fences. There was no foot traffic in the muddy street. The smell of an overfed wood fire clawed its way through the heaviness in the evening air. A single street lamp flickered on the opposite side of the street. A small portal in the pitted door opened, revealing an unpleasant expression. A tin plaque next to the door listed the address. “I have an appointment,” the man said. “This is not a hospital,” the gaunt-faced doorman replied. He got no reply. The portal snapped shut and the door opened. Far in the distance, the sound of a carriage rushing past the gate separating the Manorial District from the rest of the village faded back into the dusk. The bandaged man walked inside, causing the doorman’s candle to flicker as he strode past. Even in the candlelight, the doorman could see the grotesque texture of the man’s face only partially concealed by the gray cloth. He had obviously been horribly burned, and seemed to be completely unable to focus his remaining eye. The doorman turned his head to one side with an expression of distrust, then reluctantly walked past the row of sculpted empty frames hanging on the entry wall towards the parlor. He noticed the hilt of an expensive looking dagger sheathed along the man’s boot. Generally, visitors to a Gentry House were not permitted to carry weapons. But he decided to favor self-preservation over heroics. The foyer of the dignified mansion was warm to the point of stuffiness. Crabby flames covered a damp pile of rotted firewood in the recessed fireplace. Pieces of mismatched furniture complemented a mantled mirror anchored to the top edge of the wall, forming a nice centerpiece for evenly spaced paintings. The threadbare rug was a non-threatening color. It was all very proper. Nothing in this house was meant to draw attention. The bandaged man stood with his back turned, appearing to be examining an obviously forged painting and contemplating the concept of too proper. He carefully watched the parlor entry in the nearby mirror. His hands were clasped behind his waist. Either could easily reach the knife under his tunic. Or the scalpel inside his left sleeve. The reflection of a matronly woman emerging from the darkened hallway appeared in the mirror. Kenesh carefully examined the woman’s reflection. She wore a simple black gown decorated with an enormous toka-pearl brooch encrusted with opulent Rotenshan jewel work. He recognized the work. He knew the owner. And the former owner. Kenesh cautiously obliged, but instinctively kept a distance and followed one step behind Thea’s pace. The distinguished-looking woman walked through the equally-proper parlor with a steady purpose. The room was unfurnished but for an out-of-place rug under a dingy chandelier so plain that could have easily been used to plow a dry field. Thea’s gray and white hair was pulled up by a circlet of jasper stones around a sharp coil at the top. In her hands she carried a pair of spectacles. Kenesh took immediate account of the dining room as they entered. Three exits. Curtained window. Four people. One at the entry. He concluded those at the table were the most obvious non-threat. There were no visible weapons, but some things were to be expected. To most people the woman at the entry would have appeared to be nothing more than an overdressed merchant from a Rathshire Guild. She faked a sip of her drink as Kenesh passed. He noticed her posture shift subtly to favor her right side. Kenesh exhaled without making it obvious the woman’s purpose had been discovered. She was concealing a weapon of some kind, but inexplicably guarding the exit nobody in the room would use. Kenesh expended considerable effort to keep his breathing controlled. Getting out of this room alive was going to be enough of a toss-up. Losing his cool would just make it harder. “May I present Kenesh Drun,” Thea said with a formal air of announcing a visitor to court. She took her seat at the head of the table opposite the entry. A shadowy staircase was visible through the open door behind her chair. Once situated, she placed her spectacles on the table next to her place setting. “Please,” Thea nodded, indicating an open place at the table for Kenesh. “I’ll stand,” Kenesh replied, after quickly appraising the cutlery and the alley value of the plate. “Please take a seat,” Thea said, her expression hardening. Kenesh hesitated, then pulled the heavy cushioned chair from one side of the table and sat down, every muscle in his body tense enough to split firewood. He exhaled again, so slowly he could taste the cool edge in his breath. Thea noticed he had chosen a vantage point near two exits from which he could observe all four other people in the room. Nothing in her expression betrayed how impressed she already was with his progress. Even in her own dining room, she had no obvious advantages. “You are known as the Scaled One,” one of the men at the table offered after a few moments of silence. Kenesh did not reply. “What is your knowledge of healing magic?” the nondescript man persisted. The other drained a fine cup of its contents. “Look at me,” Kenesh replied. The merchant’s face fell. He swallowed uncomfortably, realizing the absurdity of the question as he looked at the glassy, off-center gaze. He nervously took a sip from his cup, managing to get it all the way back into the saucer before it rattled too much. The table settings themselves seemed hesitant. Sweat glistened on the forehead of one of the merchants. Kenesh tightened one fist. He tried to control his expression while making certain he actually took the time to breathe. He closed his eyes, then opened them. The woman at the door straightened, as if insulted. Thea smiled with some apparent effort. Then she took a sip of wine from a crystal goblet and set it back on the gray tablecloth. One step closer, Kenesh thought. “One hundred monarchs of pure gold for whatever drew the shadows south,” Thea said. “I avoid Witchkin and Arcanists, Thea. Especially when they are the same person. I live longer that way,” Kenesh said, gesturing politely as if explaining the obvious. He had already very nearly insulted the deadliest woman in Gacenar. Why not pressure the bet? “Two hundred,” Thea said, her smile widening. Kenesh looked at the nearest of the two impostors. It was obvious at this point the matron had filled the room with concealed weapons to avoid any “misunderstandings.” Nevertheless, discussions of such large amounts of gold seemed to be quite uncomfortable for them, at least gold paid to someone else. Kenesh guessed Thea was playing with the “merchants’” chips. West of Chaer, the gold monarch was the exclusive coin of the Branven guilds and those who cut their purses. And now it was the coin of an aspiring assassin. “Five thousand,” Kenesh said coolly as he nonchalantly examined a piece of fruit taken from the table’s centerpiece. One of the bladesmen sputtered while attempting to sip his tea and the cup slipped. A moment later the china shattered against the wooden floor. A glint of reflected light caught Kenesh’s eye from the narrow staircase opposite the dining room entrance. Fortunately for him, under the table a balanced blade already rested in his skilled fingers. The guard’s hand froze against the wall with a sickly wet thud and his weapon clattered down the last few wooden steps. He shrieked as the sharpness of the dagger blade impaling his hand registered. He was immobilized. One of the bladesmen lunged, but Kenesh caught his wrist an instant before his weapon made contact with his own neck. Drun held a bronzed hornwing claw under the man’s chin. None could say where it came from. Both men were frozen in mid-attack, gazes locked. The bladesman trembled, trying to hold Kenesh at bay. The guard again tried to dislodge the dagger from the wall, and he howled as his failure was rewarded with a barrage of roaring pain. “Silence,” Thea said. She appeared unaffected by the simultaneous start of two knife fights mere steps from her chair. The guard’s voice quieted. The sound was replaced by grunts and hisses as the guard tried to mask his reflexive reactions to the double-edged knife embedded between his knuckle bones. Kenesh pushed the bladesman’s weapon back. He carefully observed the staircase doorway for any other movement. Then he took his seat again. The woman at the entrance had used the distraction to move a step closer to him. Time was growing short. The guard finally managed to work the dagger free of the door jamb and he scuttled away back up the narrow staircase, his hand dripping on the steps. “Plus the cost of the dagger,” Kenesh added as he adjusted his chair to sit squarely. For the first time in the negotiations, Thea glanced away from Kenesh at the others. The face of the sputtering bladesman drained of its color and he gave up on his attempts to clean the tea from his shirt. The defeated stares were gratifying for Kenesh, at least momentarily. “Shadows have been seen as far south as Isia. None can say why they are on the move. The First House has informants everywhere, and the Vicereine spends her days haggling with the guilds and spreading filth,” one of the nondescript men said. Kenesh did not acknowledge the statement. “The gold,” Kenesh said, watching Thea’s face carefully. She gestured with her chin and Kenesh looked down. A golden monarch coin weighing at least four ounces rested in the cup at his place setting. Kenesh retrieved it quickly and took a moment to examine it. “How will we know you have succeeded?” one of the impostor merchants asked. A serrated knife slid from under the woman’s sleeve and dropped into her right palm, and she twisted her fingers to grip its hilt. One more step was all she needed. –and punctured the back of Kenesh’s empty chair. Splinters scattered across the fine rug. Thea closed her eyes and exhaled, then took a sip of her wine. A breeze caused the curtains to flutter. “Close the window please,” she said.